Why do children seem so much better behaved in the summertime? Is it because they are enrolled in camp and they “get all of their energy out?” Is it because being outside in nature, children are getting away from iPads and television and are less irritable without the screen time? Or maybe children are stimulating all their senses, not just their vision, which is helping their bodies work more efficiently? Well it is a little bit of everything. Research with preschoolers shows us that children who spend more time playing and exploring the world around them turn out to be better readers and have higher academic performance. It is not just practicing reading that makes good readers, it is the combination of practice and having a foundational awareness of space, sequencing, timing. This allows emerging readers to learn how to scan words left to right, not skip lines when reading, decode in sequence, and read with pacing and rhythm. It has also been identified that exercise/movement increases the production of serotonin in the body, which improves mood and helps with self-regulation. But did you also know that serotonin converts the melatonin in the body, which is the chemical that supports the ability to sleep? Getting more vitamin D by being out in the sun also helps with mood regulation, reduces fatigue and supports the natural detox process within the body. Supporting both the biological and physiological foundation for brain development is critical to helping children achieve academic success and self regulate. 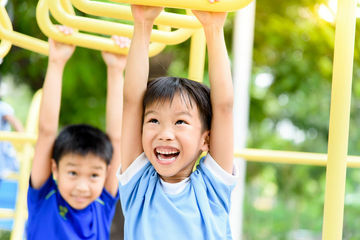 We see a shift in behavior during the summer not just because kids were running around all day and “getting their energy out.” The shift is because the combination of movement and being outdoors stimulates all the senses and helps the body to optimize the way the nervous system is working as well as the chemical processes that support overall mood and sleep regulation. But what about children with special needs who may not be able to participate in traditional camps or who avoid movement activities with peers because they require too much coordination or are too unpredictable and overwhelming? Children who have difficulty controlling their bodies may not seem more regulated being in camp that require lots of coordination such as sports camp. Instead, they are stressed out by them and often opt out of the games and activities that provide the natural movement benefits. If parents can identify the kinds of movement opportunities that are supportive for their child’s sensory needs and motor abilities, they can still reap all the benefits of summer. It may not be one summer camp but a combination of activities, going to the beach, and playing their favorite games. For some children, a daily opportunity for opportunity is the most important and beneficial part of their day. They love the water; they get out in the sun; and they don’t have to be extra-coordinated to enjoy all of the sensory benefits of swimming. While participating in Lego camp, Minecraft camp, and other camps that play to children’s interests is a great way to provide opportunities to socialize and connect with peers while doing something they enjoy, it is critical to balance opportunities for movement and being outdoors with your child’s interests. If you are looking for some backyard summer ideas to keep your children active without requiring them to be overly coordinated check out our #Bodyactivatedlearningathome and #sensationalmessyprojects boards on our Pinterest page. As the summer fades, go into the school year with a new perspective on how to keep movement and sensory play a regular part of your child’s weekly routine. Consider adding morning movement by doing silly moves to collect clothes while getting dressed or doing a body warm-up before sitting down for homework. In the winter, plan for weekend indoor activities by making obstacle courses using common items: jumping over pillows, spinning in an office chair, using yoga mats/balls to get across the room without touching the ground. You are not only “getting the energy out,” you are capitalizing on all the benefits of movement to support academic readiness, self-regulation, attention, and focus.